Prevent UGLY mineral stains caused by irrigation well water. Also use to automatically feed your lawn or repel pests every time you water. 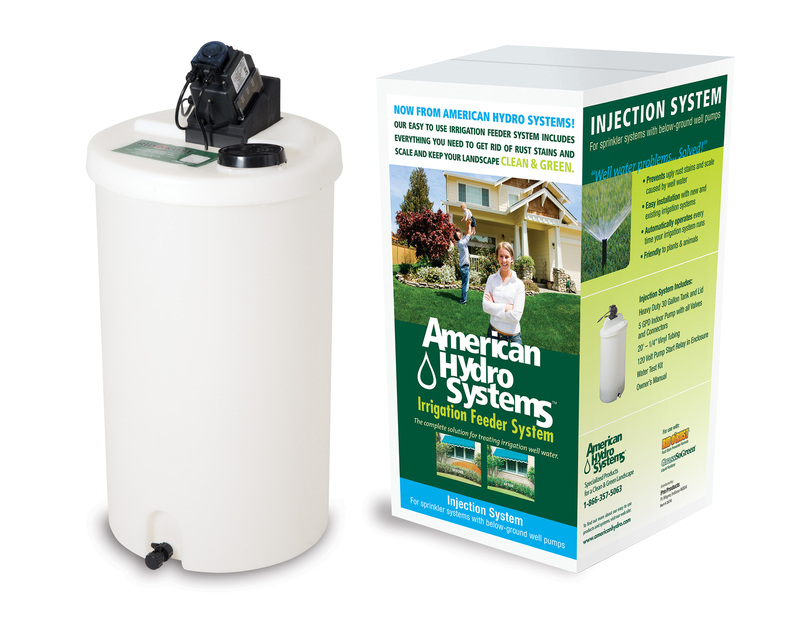 The American Hydro Systems Green Feeder Mini hooks up to the irrigation supply to capture iron, calcium and other minerals that can stain landscapes and clog equipment, or to dispense fertilizer and pest repellent. The Siphoning System works with above-ground (centrifugal) pumps and will last approximately 15 hours of irrigation time. Injection feeder systems must be used when the application involves a below-ground or submersible well pump. Use of an injection feeder is also suggested with larger above-ground pumps (over 2 hp) and any application with an above ground pump where frequent refilling of a siphoning system would prove onerous. AHS offers a complete Irrigation Feeder System for the most common situations and several different alternatives. For a custom irrigation feeder system job, choose from 4 different tank sizes (15 gal, 30 gal, 100 gal & 200 gal) and 5 different metering pumps. Part #: 2670: Includes 30 Gallon Tank and top, Pump mounting base, adjustable 16 GPD digital 110 volt pump with built –in pump start, 24 volt hook-up to master valve and common of irrigation timer, plus a well water test kit, instructions and Owners Manual.